• CE-Approved Level 2 back protector certified to the standard revision (EN1621-3:2014). 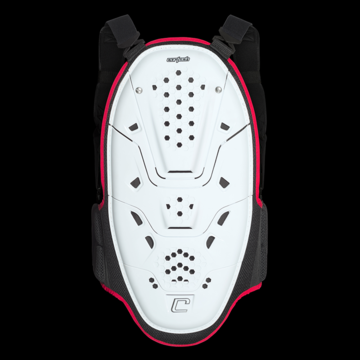 • A combination of segmented, plastic plates backed by dense memory foam allows the back protector to bend into the riding position and keep the rider safe from high energy impacts. • Removable, adjustable shoulder straps allow the rider to customize the fit to best integrate with a one-piece suit or jacket and pant. • Padded waist straps offer kidney protection and an adjustable fit around the waist. • Adjustable chest strap offers an additional option to fine tune the fit. • Mesh inner and outer construction help maximize ventilation.